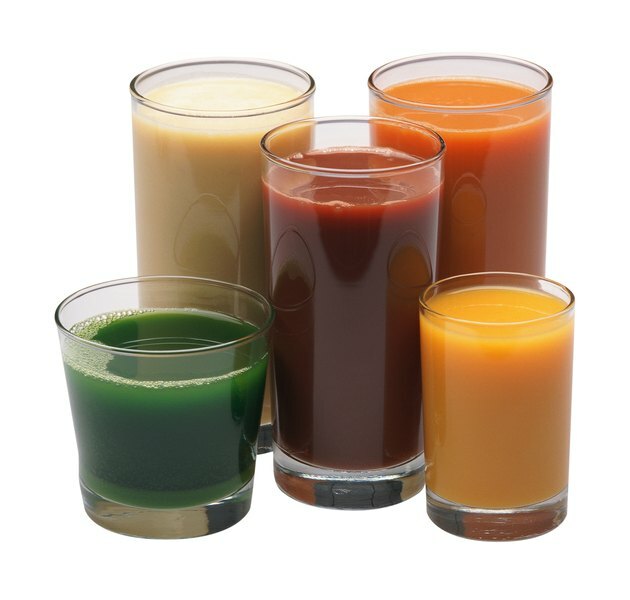 Juice fasting is a temporary restriction of solid foods in favor of raw juices made from vegetables, fruits and occasional additives like protein or whey powder. Juice fasts are employed as strategies for supporting weight loss or as components of a spiritual cleansing program. Though juice fasts are typically regarded as healthier alternatives to water fasts, light headedness is a common symptom and may signal a significant health concern. Before embarking on a juice fast, consult your doctor and a nutritionist to ensure overall health and wellness. Juice fasts involve extracting the liquid elements of fruits and vegetables and consuming them in juice form. The juice of fruits and vegetables still contains high levels of sugars, vitamins, minerals and other nutrients, but the fibrous materials that make up the solid parts of the foods are not ingested. Eliminating the solid elements of the fruits and vegetables results in more rapid digestion of the juice materials. On a juice fast, your body resorts to burning stored glycogen as a source of energy to compensate for the reduction in overall caloric consumption. Unlike water fasting, juice fasting still supplies your body with food sources of vitamins and nutrients, resulting in a reduced but still possible likelihood of significant light headedness. Initial light headedness is a common side effect from a juice fast and results from a reduction in your normal consumption of caffeine or sugar. An initial drop in blood pressure is also a side effect of juice fasting, and for people with normal blood pressure levels, the dip in blood pressure can cause a feeling of weakness and light headedness. If you do not take in enough iron through juices, you may develop anemia, which can cause light headedness. Additionally, Dr. Naomi Neufeld notes that requiring your body to use up all of its stored glycogen energy will result in burning away your muscle protein as a back-up. Once this process begins, you might start feeling light headed as your body struggles to produce enough energy to maintain normal functioning. Dr. Sandra Cabot, author of "The Juice Fasting Bible," suggests that you prepare for a juice fast several days in advance in order to reduce the likelihood that you'll experience symptoms like light headedness. Slowly reducing your daily intake of caffeine and added sugar over the course of several days prior to your juice fast will prevent a sudden shift that may cause you to feel dizzy once your eliminate the two completely. She also suggests limiting your physical exertion for the first few days of the fast until you understand your adjusted energy level. If you are feeling light headed during your juice fast, hydrating yourself with water or additional juice may eliminate the dizzy sensation. Naturopathic physician Steven Bailey also notes that persistent light headedness may indicate a nutrient deficiency and suggests supplementing your fast with a multivitamin. Though slight light headedness, particularly after standing quickly from a seated position, is not a significant concern during a juice fast, persistent or severe light headedness can indicate a health reason to stop the fast immediately. Light headedness to the point of fainting puts you at serious risk for injury. If your dizziness does not go away after a few seconds of rest or after rehydration, consult your doctor immediately. You may have an underlying health condition or a suspected drug interaction that requires you to end the fast and resume your normal diet. Will a Juice Fast Give You Diarrhea?